Which is better, the MIT Tetris building, or the Space Invaders art installation in Manchester? Both are pretty cool, but the MIT team just pulled ahead by issuing the source code of the big hack. 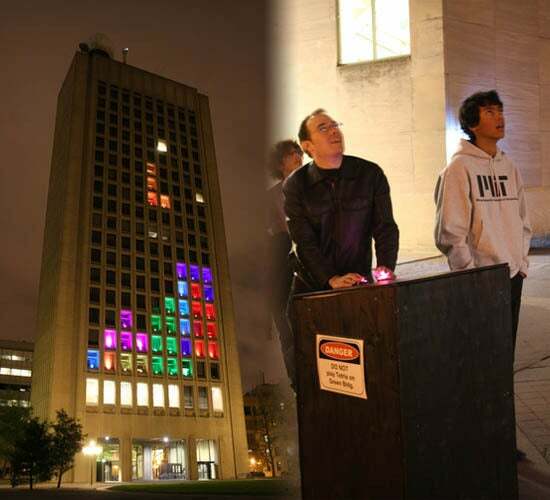 In case you missed it, a group at MIT turned one side of the on-campus Green Building into one big Tetris game, using colored lights in the windows to display the various Tetris pieces. The mystery though, was how this all worked together to create an awesome visual effect. Here's the magic explained: All of the windows were controlled via a wireless broadcast protocol, and could display 15 framers per second in 24-bit color. The wooden box housing the controller contained four lighted switches, which sent the output wirelessly to a computer. This allowed the game to run and generate the correct output for the building display. The code on GitHub provides the display plugin API, so you can write the plugins that dictate what would appear on a display (the display being a building, wall or whatever your heart desires), and in includes a test plugin so you can get a feel for how it works. Unfortunately, the pack doesn't provide the code that lets the control system work with the display--this is something you will have to play around with yourself. On the flip side, at least the limited software released means you get more room to experiment yourself, meaning you could possibly create something even more epic! If you're looking for an idea though, here's one suggestion: Pac Man. Don't forget, if you create a Pac Man building game or something equally as impressive, don't forget to tell GeekTech! Get all the code you will need, plus a few explanation notes from the team on using it, over on their GitHub page.